MewnBase community · Posted in sun icon on map? All you need to do is log into itch.io, and go to the game's page and click the download button up at the top to grab the latest version. I just reproduced that very easily, can't believe hadn't noticed it before. Figured out the issue this evening, was a leftover bug from my last round of item stack refactoring. Will get the fix out in the next update asap. Thank you for posting it! Thanks for finding that one. Realized last night that I had only setup the pavement tiles to check to make sure they weren't being placed on top of an existing floor tiles. Made a fix for it to include wood ones, and it'll be out soon in the next update. More tooltips on the crafting screen recipe ingredients is def a good idea. You can re-arrange your inventory by drag and dropping items. You can also transfer whole stacks in the storage UI via Shift-Click. MewnBase community · Posted in How was MewnBase made? MewnBase community · Posted in How to use the trailer? Should just be a matter of parking the buggie in front of the trailer so that the joints are semi-near eachother, then get out of the buggie, and left click on the trailer and it should auto connect. If that doesn't work let me know. Hey! Happy that the macOS version is working for you :O (there's a launch crash for a lot of mac users, but haven't been able to figure out any rhyme or reason to the issue yet). Out of curiosity, what kind of year/model mac do you have? F1 is the default key to show/hide it. MewnBase community · Replied to Pet.Waterdew in Possible bug or I just never saw it before? The update (0.46.1) is now out on itch.io and Steam that should fix both a crash-bug with lightning strikes, and the issue where they were draining all a base's batteries. MewnBase community · Posted in Possible bug or I just never saw it before? I confirmed last night that there was definitely a bug causing ALL the batteries to get drained by a single lightning strike. Fixed the problem, and will have an update coming out later this evening with a bunch of fixes to issues that had been reported over the past week. Yep, as @nooneimportant12321 mentioned: hold down right-mouse button to pickup base modules. It's mentioned in the tutorial. They're pretty easy to reconfigure. I'll take a look at it again to make sure things are all getting unlocked in the right order. Hey - someone else recently pointed that out. The strike is supposed to drain 1000 power from a hit base's power supply. A single battery holds 750, so 2 full batteries should be enough to withstand a single strike. I'll make sure to test this out some more. I think a lightning rod is would def be a good idea though, especially for larger bases. Steam version is being released Friday (Dec 7th). So look at your download page (the url that is emailed to you after purchasing a game on itch.io) sometime Friday afternoon. 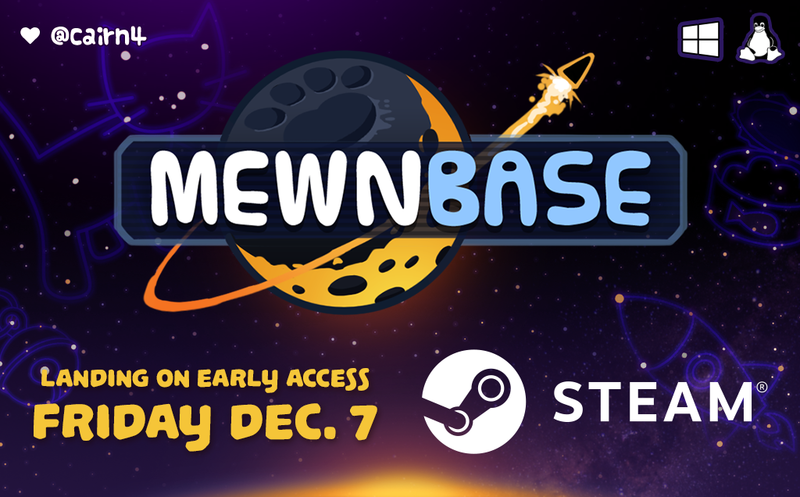 MewnBase is coming to Steam this Friday! Having had a wonderful home on itch.io for the past two years, my little weird space-cat/survival/base-building game is making the next step by launching on Steam Early Access. What if I already own the game on itch.io? 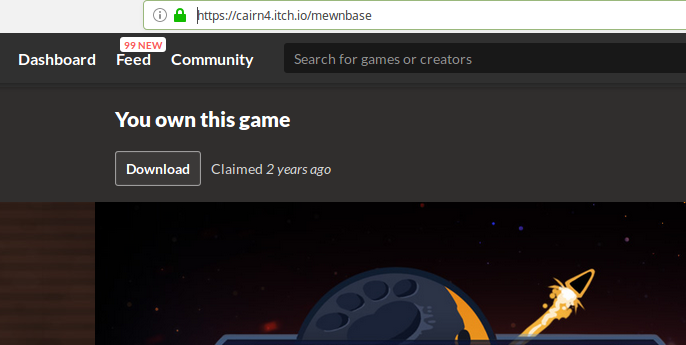 If you own the game on itch.io (thank you), you will be able to get a free Steam key for it on your MewnBase downloads page (once the Steam version is available for sale). What will happen to the itch.io version? Itch.io is an amazing platform and MewnBase won't be leaving it anytime soon. The itch.io version will continue to receive updates at the same pace as the Steam version. The game will be launching at $5.99 USD on Steam, the itch.io price will also be rising to match. Oh weird :O Think you could send me a screenshot or something of it? Do you know what videocard / driver you're using? Fairly certain I'm just running the Mesa driver on my Linux Mint machine with an ancient Intel HD4000. ...to get 10 of them. Use "listItems" to see all available item names. Hey! So you were next to one of those modules, but after dying and reloading, you spawned right on top of it? Were you able to walk off of it? Which item was in your inventory that got double? Is anyone with this issue able to run the game by downloading the zip from the store page and running it there (instead of through the itch desktop app)? Or running the game/desktop-1.0.jar file (if you have Java installed on your machine)? I also put up a new build 0.44.1 last night that has some engine and library updates - might be worth trying out. Also also, after this crash happens, are there any crashlog_[datestamp].txt files appearing in the folder with the game's EXE? First time I've seen an error like that, will try and look into it more. In the meantime, as a long shot... have you tried the plain java version? (assuming you'd have OpenJDK or Java installed on your machine). Hey! Thanks for the feedback. That was def something I realized after I got them in: that the warning color of red wasn't looking good the way I had it setup before (when both bars were just orange by default). Will have to think about how best to make sure that players can still easily notice at a glance once something has run low / run out. Awesome, thank you! Will look into them this evening. Please email me the crashlog txt file over to steve@cairn4.com, it should be right in your main MewnBase folder with the exe in it - thanks! Just uploaded "mewnbase-testing.zip" to the store page https://cairn4.itch.io/mewnbase - this is a preview version of v0.44 that I'd love to get some people to check out and test their save files with. It also features the new HUD redesign. There's two ways to test out this version of MewnBase. Method 1 (preferred, so that you can load up an existing save file): First, make a backup of your existing MewnBase folder. Then replace the .jar file with the new desktop-1.0.jar from this zip. If you encounter a crash or game-freeze, please let me know!